For a commercial building owner, leaks and other roof damage can be an absolute nightmare to locate and repair. To access hard-to-reach parts of a building, roofers often have to use expensive lifts or cranes, and it can take days to fully analyze a large commercial roof. However, roofing has come a long way through the years with new technology and equipment. Drones are the latest tool to land in the roofer’s equipment arsenal, and they’re revolutionizing the way commercial roofs get repaired. With a traditional roof assessment, roofers must climb atop the roof and manually search for damage. This process is time-consuming and requires hours of planning to secure the appropriate equipment to keep roofers safe. If the roof has multiple points of damage, roofers must examine each problem area individually. While traditional roof assessments can take several days, an aerial drone can easily fly over any type of roof and take photos within hours or minutes. 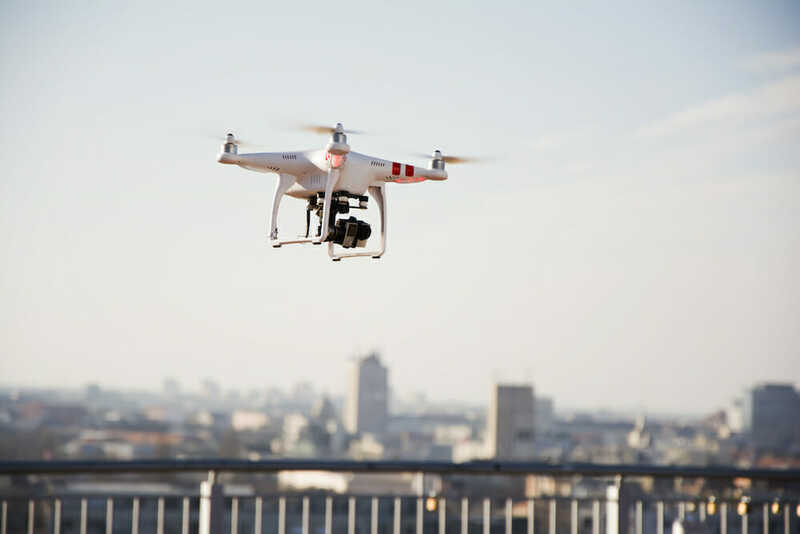 In just that short amount of time, drones can conduct an entire building envelope survey without the disruption caused by having a crew on the roof. High-end drones are expensive pieces of equipment and learning to pilot one is a specialized skill. But, even a well-trained pilot and a nice drone cost less money than a roofing team and the equipment needed to get them safely atop a roof. Using drones frees up qualified roofers to focus on other parts of their job, making assessments cheaper for the company and the customer. Using a drone for roofing measurements and other simple tasks eliminates human error. When paired with special imaging equipment, like infrared cameras, drones can also detect damage that would be difficult for the human eye to spot. Roofing companies can even use machine-learning software to analyze drone images and identify the types of damage, eliminating the guesswork in traditional inspections. To get their jobs done, roofers often have to climb, balance, or dangle in precarious positions. While good roofing companies always have the best safety equipment to keep their employees safe, falls and other injuries are always a risk with traditional roof surveys. While drones are not immune to damage, a broken propeller is certainly preferable to a broken arm. While drones are becoming more prevalent in the roofing industry, their use hasn’t yet spread into the mainstream. More widespread use of drones could allow roofers to offer cheaper and more frequent inspections. In the future, drones will be equipped with better cameras, opening up even more opportunities for drone roofing. Having the best technology can give roofers a cutting edge, but expertise and experience still matter. Maxwell Roofing & Sheet Metal, Inc. has been around for more than 60 years and has maintained its reputation and quality of service through many shifts in technology. Learn more about Maxwell Roofing & Sheet Metal, Inc.’s drone services and contact us today.